MUTE arise in Aspe (Alicante, East Spain) in late 2004. They recorded two demos, play live and participate in bands contests, but not until 2008 when they begin to draw media attention and programmers. It is at this time when [self] released their first album, "Historias Mínimas", with winning competitions Rock & Sax and the 9th Contest of young musicians 2008 from Alicante, in addition to being among the finalists in numerous festivals and national competitions, as Foc & Sound, LemonPop, LagartoRock, Summercase, etc. Between 2008 and 2009 intensified his live concerts on the venues in Spain and participated in several compilations: "Family Album II" a tribute to Surfin Bichos , "Lemon Pop2008 " and "Compilation of the Club de Amigos del Crimen". In 2008 combine live shows with the writing and recording their next album. 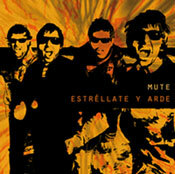 At 2011, MUTE are ripe to take a step forward and booked by Flor y Nata Records, the oldest of the spanish indies (1981-2011) with whom they released their second album "ESTRELLATE Y ARDE", recorded in August 2010 in studies Garate by Kaki Arkarazo in Andoain. With the CD in hand, the first piece, instrumental, we get to the bustle of the awakening of any city, giving rise to "CANTOS POPULARES" a production that combines attention to detail sharp guitars and delicate melodies, which serves as a preamble the first hit single from the album: "NO ME JODAS", blunt title for one of those songs that goes direct to the first listen. The 11 cuts of "ESTRELLATE Y ARDE" arrangements exude taste and attention to detail, through his letters we discover that each has its own world: "We like our music and our lyrics are understandable", and, in piece title track, "ESTRELLATE Y ARDE" harmonic voices are immersed in an atmosphere of film of Far West, while "DÍAS TAN PERFECTOS" is about to pop perfectionist that spreads easily. MUTE are difficult to label band with many influences: "We are not advocates of a closed style, our influences go beyond a horizon marked, do not disown the indie or any other label, but do not give them importance." In a MUTE disc iimportant goes into a combination of dark atmospheres with perfect proportions, among which is always possible to see through a ray of light that shines brightly through direct tunes and suggestive lyrics. MUTE are: Víctor Prieto (voice & guitar), Ángel Boronat (guitar y programations), Jorge Valero (drums) & Carlos García (bass).